It's always exiting to dive into new tech and if You are waiting for it for ages nothing compares to the feeling. I was on the managing position for too long not to make somebody to solve the task for me. My friend programmer we made games with tested the helmet on not mobile PC. He was intended to tune/build our latest game Naughty Who? for Oculus Rift during the time I was on vacations. Unfortunately or fortunately he spent one or two days with drivers and SDKs integration support and has given up. So it's became my personal task. Naturally I thought that I should take Oculus DK2 and forget about the problem. Oculus Development Kit 2 appeared to ship to 8 countries only and mine is not surprisingly not on the list and it's sold out. In addition DK2 would be great with the new controller that's not avail yet or I don't know how to get it. It may look as a problem and dead lock once again and it's not at all. Virtual Reality projects and at least Oculus are still in beta and I'd say prototyping phase (not sure about Morpheus/PlayStation VR). So it's not a matter of the latest/best hardware, it's the matter of any working hardware to test Your game or/and (pre)shape it. Now I understand that Cardboard is a good idea. The demo runs. Let's go to "Hello World" phase. Funny and it's taken me several days of the real time and several weeks. 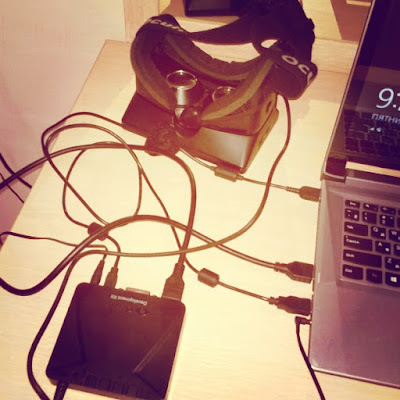 Basicly there are two articles that helps mixed with a helper script and strong will to: Unity Tutorial Rollaball Intro it should work from the box if You have DK2 I guess and Getting Started with Unity and Oculus Rift SDK 0.4.0 (0.4.4 actually). Integration with older Unity was implemented with the single package included with Oculus PC SDK 0.4.4 Beta. You just import it as usually. There are 2 prefabs for OVR (OculusVR) Camera Rig and OVR Player Controller and 4 scripts that manage and modify Editor Game View and build the scene. They work inside Unity Editor and don't depend on GPU hardware and Oculus output pre-compiled .dll. Thanks to Google, Reddit and Unity Answers that allowed to gather info to figure it out and a hack idea from the Getting Started with Unity and Oculus Rift SDK article especially. Now I just resize game window to 1280x800 and watch it on helmets screen :) I've not managed to do it like the article suggested so I've used Unity Editor customization and scaled/placed the window/viewport properly with the script form the Unity answers. Now I've got my "Hello World" in this case Roll a Ball demo for Oculus DK1 with SDK 0.4.4 on mobile GPU with HDMI with Unity 5.2.1f1.